Twenty-fourth session of the Committee – paragraph VIII.24 / Annex X page 111. Main issues: pollution and grounding of a vessel, integrated land and catchment management. New information: At the twenty-fourth session of the World Heritage Bureau, the State Party was requested to submit a report on the grounding of a vessel in the Great Barrier Reef World in November 2000. The State Party transmitted a report to the Centre as attachment to a letter of 19 April 2001 from the Australian Permanent Delegate to the Director of the Centre. The report was sent to IUCN for review and comments. On 2 November 2000 the 21,000 tonne Malaysian container vessel MV Bunga Teratai Satu went aground on the north-western side of Sudbury Reef, southeast of Cairns and within the World Heritage site. The 184-metre vessel was en route from Singapore to Sydney. It was carrying fuel oil, diesel oil and some hazardous chemical goods. The vessel was outside the compulsory pilotage area, and hence, no pilot was on board at the time of grounding (the pilot had disembarked at Cairns approximately 2 hours earlier). On 14 November 2000 the vessel was refloated after 13 days aground. In February 2001 the Malaysian International Shipping Company (MISC), which owned the vessel, was fined AUS$400,000 under the Environmental Protection Act for the environmental damage caused. The Great Barrier Reef Marine Park Authority (GBRMPA) noted that the vessel caused severe but localised damage to the Sudbury Reef. The ship ploughed a path through the reef, destroying an area of approximately 1500m2. Rubble and blocks of reef rock pushed up on either side of the hull scar have created a ridge of 5-10m wide and 1m high. Subsequently, an area of 30,000m2 was affected by relatively low levels of contamination as a result of the dispersal of flakes of paint by the propeller work of the ship during an attempt to refloat it. 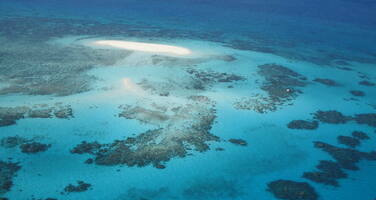 partially stabilise the reef substrate at the primary impact site to facilitate the natural recovery of the area. The clean-up effort began on 9 January 2001 and was completed on 27 March 2001. It was carried out in two phases; phase 1 involved the clean-up of the impact area of 1,500 m2, followed by phase 2, when a larger area of 30,000 m2 that had low levels of contamination as a result of the dispersal of antifoulant flakes from the plume of sediments raised by the propeller work of the ship during an attempt to refloat, was cleaned up. The operation took longer than expected to complete due to the large amount of TBT-containing anti-fouling paint buried deep in the sediment and delays due to bad weather. It included a team of divers and scientists using heavy equipment such as pumps, barges, and underwater vacuums to remove paint from the reef that had scraped off the ship’s hull. It proved impossible to remove every trace of TBT from the area and scientists say that, although it is unlikely that the remaining paint will have a significant impact on fish and adult coral, it may be toxic to larval coral for several years. Large pieces of coral have also been replaced into the trench area formed by the hull of the ship in order to facilitate natural recovery. A long-term site-monitoring programme is under review by GBRMPA and interested parties. Declaring the Whitsunday Islands a compulsory pilotage area. IUCN notes a report by the Brisbane Institute on the outbreaks of Crown of Thorns starfish on the Great Barrier Reef. The tourism industry is said to be spending AUS$2 million a year in trying to keep their dive sites clear of the starfish, mainly by injecting them with wine bottle sterilising solution. Such outbreaks of the starfish are thought to be a natural occurrence on a 12–15 year cycle and the species dies back naturally. There are concerns, however, that the third major infestation to affect the Reef is not dying back naturally. Human-induced factors may be shortening the interval between the outbreaks, which may now be occurring at 3–5 year intervals. The most likely suspects triggering the outbreaks are nutrient laden coastal run-offs – thought possibly to provide more food for the larval stage of the starfish, and fishing – and most likely deplete the predators of juvenile starfish. There is also some evidence that major flood events have a correlation with the outbreaks, as well as the general increase in the sediment load of Queensland rivers flowing into the Great Barrier Reef. Nitrogen-polluted waters that flow into the Reef may be a significant factor in the growth of the phytoplankton that forms the food of the Crown of Thorns. No effective legislation is in place in Queensland to manage this agricultural pollution. In early 2001 Queensland Premier, Mr. Beattie, announced that his government would take an active role in protecting the reef, starting with a Crown of Thorns research and eradication programme. Reef researchers are keen for more work to be done on the links between river outflows, pollution levels and the Crown of Thorns. The Bureau commends the rapid action taken by the State Party for cleaning up impacts of the accident on the Sudbury Reef and its efforts to revise legislation, based on lessons learned from the clean-up operations, in order to improve safety of shipping within the Great Barrier Reef Marine Park. In the light of this accident, the Bureau stresses the importance of compulsory pilotage of large vessels, especially those carrying hazardous materials, throughout the World Heritage area. The Bureau notes the need for effective response strategies to minimize environmental impacts in the case of marine accidents through consultations with key stakeholders, including traditional owners. The Bureau expresses concern over the possible impacts that remaining pieces of TBT could have on larval coral in the impacted area and urges the State Party to finalize the long-term site-monitoring programme that is currently under review. The Bureau invites the State Party to submit a progress report to the Centre, before 15 September 2001, on follow-up actions to improve shipping safety in the Park and launch a long-term site monitoring programme as well as on the issues related to the outbreaks of Crown of Thorns Starfish highlighted by IUCN for review by the twenty-fifth extraordinary session of the Bureau. In 1999, the Australian Committee for IUCN (ACIUCN) initiated a process for monitoring Australian sites that has now been applied to the Great Barrier Reef, Shark Bay and the Wet Tropics of Queensland. In the case of Great Barrier Reef, Focused Recommendations and a Framework for Management were adopted by the Committee and Australia has committed to submit a progress report on the implementation of priority actions to the twenty-sixth session of the Bureau in 2002. The Australian authorities have also agreed to work with ACIUCN to prepare a Framework for Management, based on Focussed Recommendations already discussed, for Shark Bay and the Wet Tropics of Queensland, as part of Periodic Reporting activities to be undertaken in the Asia Pacific Region during 2002/2003. The Plan notes that over the last 150 years, the sediment load has increased by 300-900%, phosphate by 300 –1500%, total nitrogen by 200-400%, respectively and that pesticide residues are now detectable in sub-tidal sediments. For the 2001-2011 decade, the plan proposes the reduction of sediment by 38%, nitrogen by 39%, phosphorous by 47%, and chlorophyll by 30-60%, respectively. It is also proposed to reduce the detectable levels of heavy metals and pesticides. · Initiation of public and catchment specific education programmes about the connectivity between land use and the impacts on the Reef. WWF-Australia has estimated that the cost of a significant restoration programme to mitigate pollution and to clean up the waters flowing into the Great Barrier Reef (GBR) would be in excess of AU$300 million and has identified the following actions as key to success: (i) an immediate and permanent moratorium of land clearing in the GBR catchment; (ii) urgent legislative protection for coastal freshwater wetlands; (iii) all agricultural activities to be regulated under the Queensland Environment Protection Act 1994; (iv) fertiliser and pesticide use to be licensed; (v) legislative discharge limits for acid sulphate soil to be set; and (vi) a major GBR catchment riparian revegetation and wetland restoration programme to be designed and financed. IUCN notes that the Great Barrier Reef Catchment Water Quality Action Plan initiative directly addresses one of the major issues raised in the ACIUCN report on the Great Barrier Reef Marine Park, relating to the need for more effective catchment management in lands adjacent to the Park. V.106 The Bureau recalled that at the twenty-fourth session of the World Heritage Bureau, the State Party was requested to submit a report on the grounding of a vessel in the Great Barrier Reef World Heritage Area on 9 November 2000. The State Party transmitted a report to the Centre via letter of 19 April 2001, which was sent to IUCN for review and comments. V.107 The Great Barrier Reef Marine Park Authority (GBRMPA) noted that the vessel caused severe but localised damage to the Sudbury Reef. The ship ploughed a path through the reef, destroying an area of approximately 1500m2. Rubble and blocks of reef rock pushed up on either side of the hull scar have created a ridge of 5-10m wide and 1m high. Subsequently, an area of 30,000m2 was affected by relatively low levels of contamination as a result of the dispersal of flakes of paint from the propeller work of the ship during an attempt to refloat it. GBRMPA staff and independent representatives of the Malaysian International Shipping Company (MISC) implemented a clean-up programme based on a mutually agreed upon methodology, whose primary goals were to remove the antifoulant from the marine environment to a level where it will not have long-term effects on the benthic communities (especially corals); and to partially stabilise the reef substrate at the primary impact site to facilitate the natural recovery of the area. V.108 The clean-up effort began on 9 January 2001 and was completed on 27 March 2001. It was carried out in two phases. The operation took longer than expected to complete due to the large amount of TBT-containing anti-fouling paint buried deep in the sediment and delays due to bad weather. A long-term site-monitoring programme is under review by GBRMPA and interested parties. V.109 The State Party informed IUCN that a review of actions to improve ship safety and pollution prevention in the Great Barrier Reef is being conducted by a steering committee comprising the Australian Maritime Safety Authority, Commonwealth Department of Transport and Regional Services, GBRMPA and the Queensland Department of Transport. Public consultation sessions started in February 2001. The steering committee is due to report to the Minister for Transport and Regional Services on 29 June 2001. GBRMPA has initiated a number of legislative changes to improve ship safety within the Great Barrier Reef as a result of this accident. V.110 IUCN noted a report by the Brisbane Institute on the outbreaks of Crown of Thorns starfish on the Great Barrier Reef. The tourism industry is said to be spending AUS$2 million a year in trying to keep their dive sites clear of the starfish, mainly by injecting them with wine bottle sterilising solution. There was also some evidence that major flood events have a correlation with the outbreaks, as well as the general increase in the sediment load of Queensland rivers flowing into the Great Barrier Reef. Nitrogen-polluted waters that flow into the Reef may be a significant factor in the growth of the phytoplankton that forms the food of the Crown of Thorns. No effective legislation is in place in Queensland to manage this agricultural pollution. In early 2001, Queensland Premier, Mr. Beattie, announced that his Government would take an active role in protecting the Reef, starting with a Crown of Thorns research and eradication programme. Reef researchers are keen for more work to be done on the links between river outflows, pollution levels and the Crown of Thorns. V.111 The Delegate of Australia stated that his Government had committed to a range of reporting requirements on this World Heritage Area. The State Party had agreed to report on these issues to the twenty-sixth session of the Bureau in 2002 on priority action areas of the ACIUCN Focused Recommendations in the context of Periodic Reporting. In addition, the Delegate of Australia informed the Bureau that the Australian Deputy Prime Minister and Minister for Transport and Regional Services would shortly receive a report from a high-level Steering Committee on actions to improve shipping safety and pollution strategies. V.112 The Bureau commended the rapid action taken by the State Party for cleaning up impacts of the accident on the Sudbury Reef and its efforts to revise legislation, based on lessons learned from the clean-up operations, in order to improve the safety of shipping within the Great Barrier Reef Marine Park. In the light of this accident, the Bureau stressed the importance of compulsory pilotage of large vessels, especially those carrying hazardous materials, throughout the World Heritage area. The Bureau noted the need for effective response strategies to minimize environmental impacts in the case of marine accidents through consultations with key stakeholders, including traditional owners. The Bureau expressed concern over the possible impacts that remaining pieces of TBT could have on larval coral in the impacted area and urges the State Party to finalize the long-term site-monitoring programme that is currently under review. The Bureau invited the State Party to keep the Centre informed on progress on these issues in the context of the Periodic Reports by the State Party in 2002/2003.